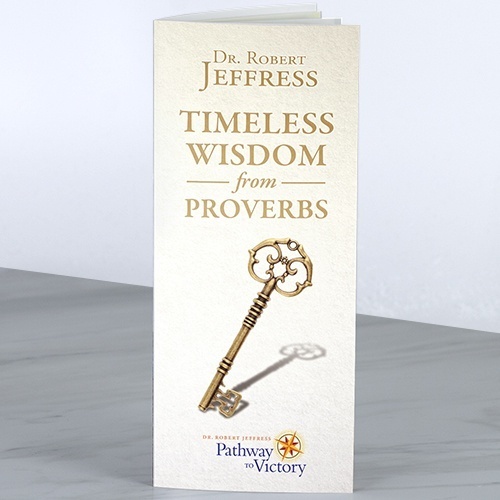 Timeless Wisdom From Proverbs is a brand-new, ministry-exclusive resource from Dr. Robert Jeffress and Pathway to Victory. This informative 44-page booklet is filled with practical wisdom from the book of Proverbs. Timeless Wisdom From Proverbs is written in a way for you to share this bold, biblical, practical wisdom with the teens and young adults in your life. An excellent tool for parents and grandparents! Convenient and easy-to-understand and fits perfectly into your Bible. Filled with 12 biblical-based topics, including peer pressure, envy, self control and anger, relationships with parents, friends and dating, as well as advice on finances and planning. Fill out the form below to request your complimentary resource today, and we will mail it to you! Your privacy is important! Pathway to Victory will not share or resell your information with other organizations.